I grew bell peppers in my garden this summer, and they did pretty well, if i do say so. 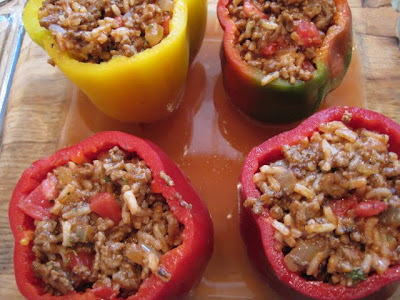 I had these last four peppers and decided to make Stuffed Peppers like my Mother used to. I don't know if she had an exact recipe or if she just did made them from memory, but her stuffed peppers were always delicious! I try to make them several times a year so that I don't forget how, so I guess it's high time that I wrote the method down. That's why I started this blog anyway, to put old family recipes on paper so that I wouldn't forget them. These peppers certainly qualify as an old family recipe. So let me tell you how to make these marvelous peppers! First off, you need to brown some lean ground beef in a skillet with some onions. Let the meat brown before turning it over and breaking it apart. Don't just stir it around until it's grey. Meat needs to brown to bring out its great flavor. To the meat mixture add the cooked rice, tomato sauce, diced tomatoes and seasonings. Cut the tops off of the peppers and place in a baking pan with fairly high sides. Pack the meat into the peppers. Bake for about 50 minutes and voila! Dinner is served! You'll have nice tender peppers full of deliciously seasoned, tender meat. This is home style food at its best! In a large skillet over medium high heat, brown the ground beef and the onion. Drain off any fat. Add the 1 cup of cooked rice, 3/4 cup of tomato sauce, diced tomato, garlic, parsley and salt and pepper to taste. Stir and simmer while preparing the peppers. Cut the tops off of the peppers and remove the seeds and membranes. Place peppers in a baking pan with fairly high sides(about 2 inches). Spoon the beef filling into the peppers, packing down somewhat, to the top. There should be a little tomato sauce left in the can, so fill the can about 3/4 full with water and pour it into the bottom of the baking dish. Cover the pan tightly with foil. Bake in a preheated 350 degree oven for 45-50 minutes. Check to see if the peppers are tender. If not, cover and bake another 5-10 minutes. Remove foil and add a little cheese on top of each pepper, if desired. Bake just til cheese melts. Don't let it get rubbery like I did! I sprinkled the cheese on top, placed the pan back in the oven, and went back to playing with my granddaughter, so I over baked the cheese! At least the filling was delicious, so that made up for the rubbery tops. My mother would sometimes add corn to the meat filling just to change it up some. It's quite good that way, plus the filling goes a bit farther. Also, It will depend on the size of the peppers as to how far the filling will go. I know there are other methods in making stuffed peppers, but this is my tried and true version. Hope you enjoy them! Stuffed peppers are so good, aren't they? They are such a welcomed addition to our table as well, but it's not a recipe we see too much anymore. Sadly, it seems it's now someone's mama who made this wonderful recipe, and not too many of us seem to make it anymore. Thank you posting this. We need to keep the food memories going! Wow, they look delicious! Funny enough, my mom and I are going to make stuffed pepper tonight! 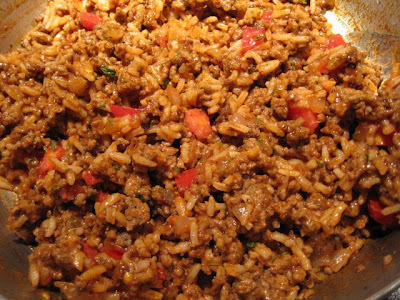 The stuffing is very similar, with rice and ground beef too. 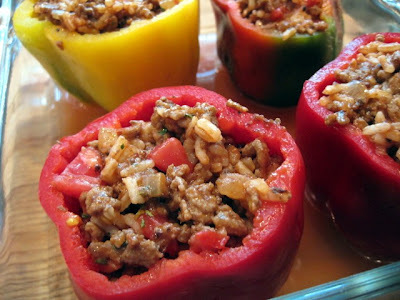 I make stuffed bell peppers but for some reason, I have never made with with the red and yellow peppers. What a beautiful dish. your mama knows her stuff--these look stellar! the filling is hearty, the cheese is absolutely essential (even if it's rubbery), and the peppers themselves are gorgeous. bravo! These look absolutely delicious. It's a great recipe. 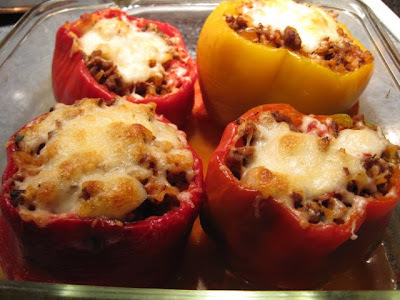 I love stuffed peppers - this recipe looks simple, hearty and delicious. Thanks for the reminder - I do love these and the pepper are abundant. Your filling is fileld with goodies and comfort and the cheese is the best wrapping ever. Your mother has good taste! Haven't made stuffed peppers in years! I forgot how great they are. Mothers have the best recipes, don't they? Going to copy yours. I froze lots of peppers from the garden this year so I have plenty to make stuffed peppers. I like this version very much! The last time I made them they got like a ball in the pepper, I like your way of making them better then mine!! My husband was just mentioning the other day that I haven't made stuffed peppers in a while! I can't wait to try your recipe! I love stuffed peppers! Congrats on growing such robust specimens. I love stuffed peppers. This look really good!